^ Brownworth, Lars (2009) Lost to the West: The Forgotten Byzantine Empire That Rescued Western Civilization, Crown Publishers, ISBN 978-0-307-40795-5: "…the Muslims captured Ephesus in 1090 and spread out to the Greek islands. Chios, Rhodes, and Lesbos fell in quick succession." p. 233. 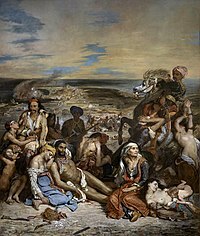 ^ Revolution – The massacre of the island of Chios. chioshistory.gr. [30 March 2011]. （原始内容存档于2011年10月2日）.